A strong, square design gives this Side Table its bold, modern feel. Crafted from solid Acacia wood in a wire brushed brown finish, this table features a plank style top with exposed mortise and Tenon corner joints that perfectly balance the elements of classic farmhouse and contemporary style. The top of the table provides ample of space for keeping remotes, magazines, and a cup of coffee within arms reach, while the open bottom shelf offers additional space to stack books and display special objects. Set this Side Table next to your sofa or a chair and create a striking look in your home. Note: Other featured items in image except this side table are sold separately. 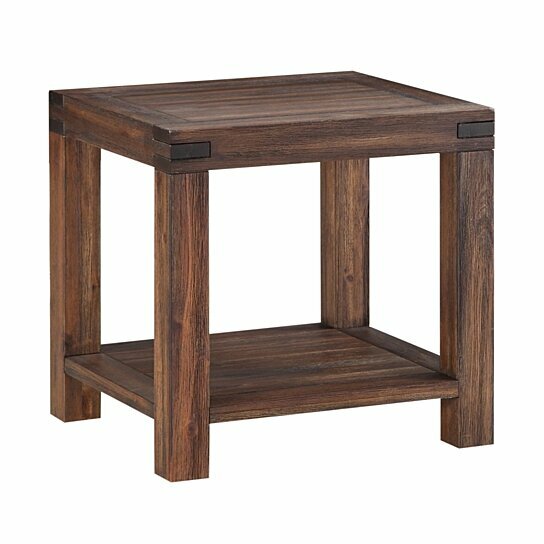 The top of the table features plank style design and exposed mortise and Tenon corner joints. Made from solid acacia wood this table will ensure long term utilization. The open bottom shelf of this table offers additional space to stack books and display special objects.